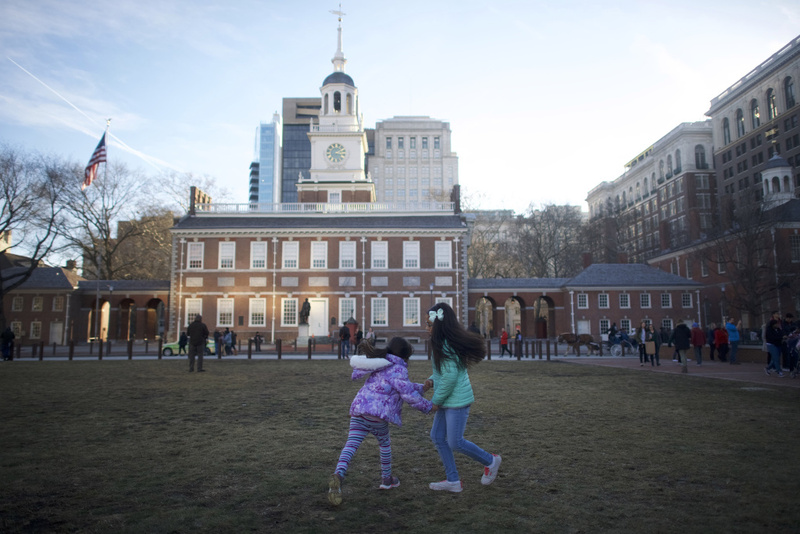 Girls play in front of Independence Hall on January 20, 2018 in Philadelphia, Pennsylvania. In what is believed to be a first-of-its-kinds law in the U.S., Utah’s governor has signed a law that allows parents to let their children play alone in a park or walk home alone from school without fear of being prosecuted for neglect. The so-called “free-range parenting” bill removes activities from the Utah’s definition of child neglect that, according to the bill, children can reasonably do without supervision, so long as the child’s “basic needs are met and [they] are of sufficient age and maturity to avoid harm or unreasonable risk of harm.” So, under the new law child services can no longer remove children from their parents if, for example, they are found walking or biking to or from school alone, playing alone outside, or traveling alone to recreational or commercial facilities. The “free-range parenting” movement centers around the idea that kids should be allowed to do certain things on their own without suffocating oversight from mom and dad. It was coined by former New York Daily News columnist Lenore Skenazy, who wrote a story for the New York Sun in 2008 about how she, at her 9-year-old son’s request, left him alone in a New York City department store with a MetroCard, $20, some quarters for a payphone call (just in case) and the task of finding his own way home. He returned safely, and with a new sense of independence. Skenazy’s story, of course, went viral. Some lauded Skenazy for trusting her son’s intelligence and decision-making skills enough to let him navigate his own way home. Others accused her of of poor parenting and wondered how any mother could simply leave her child to find his own way home. The issue resurfaced nationally three years ago when a couple from Maryland were charged with child neglect for allowing their 6 and 10-year-old, walk home alone from a park. They were eventually cleared and their children returned to their custody, but it raised questions about how much leeway parents should be given to decide what activities are safe for their kids to do alone. What’s your take on this legislation? Do you think more states should pass a law like it? What, if any, potential unintended consequences do you see? What do you think about the idea of “free-range parenting?” Do you consider yourself a “free-range parent?” Why or why not?